Every week, I post one recipe from Latviešu ēdieni. I have to say, I’m very happy with this one. 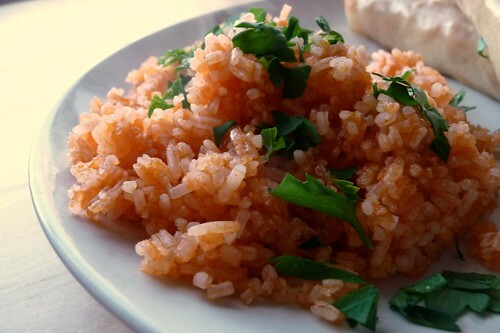 It’s a variation on fried rice that tastes sweetly of tomato with a buttery finish. It’s definitely a keeper. Cook rice with salted water (a healthy pinch or so will do). In a medium skillet set over moderate heat, melt butter. Stir in tomato sauce and a pinch of salt. Add the cooked rice and cook, stirring constantly, until the grains have soaked up all of the sauce and begun to brown on the edges. Sprinkle over with fresh parsley and serve. This entry was posted in gluten-free, latvian, recipes, rice, side, untranslated, vegetarian. Bookmark the permalink. This looks so simple to do. I may try it tonight or tomorrow cause I have tomato sauce in the fridge and I don’t want to waste it.